Thanks to Frantisek Kovarik and his team we have in the last years seen a much needed update of the scorpion fauna of East Africa. 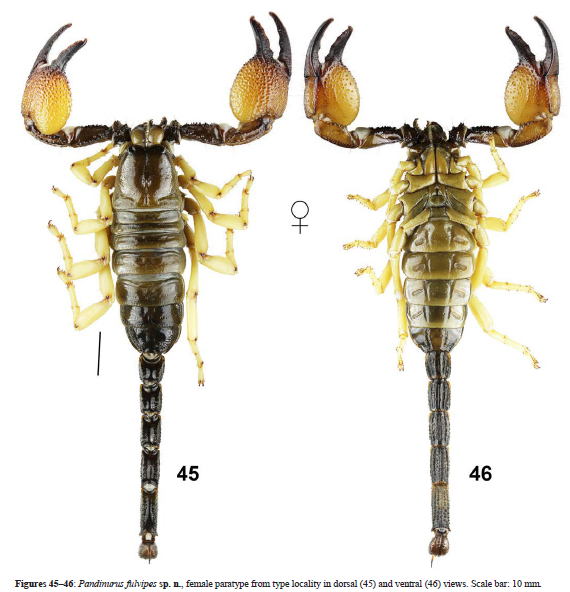 In a new contribution recently published, Kovarik and co-workers present a new species of Pandinurus Fet, 1997 (Scorpionidae) from Somaliland. The male of Pandiborellius meidensis (Karsch, 1879) from the same area is described from the first time. The male of Pandiborellius meidensis (Karsch, 1879) is introduced for the first time and illustrated in detail with color photos, and sexual dimorphism and occurrence of the species are discussed. Pandinurus fulvipes sp. n. from Somaliland is described and fully complemented with color photos of live and preserved specimens, as well as of its habitat.